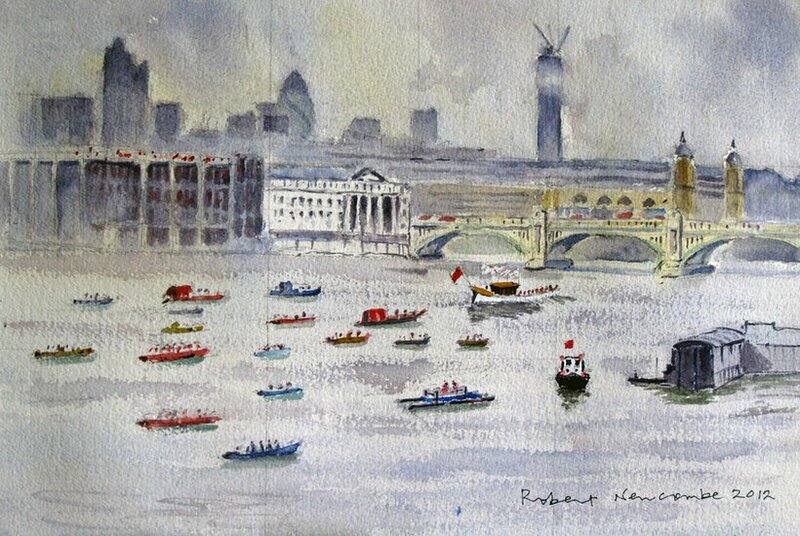 Water colourist Robert Newcombe was one of 20 artists invited by the BBC to provide their interpretation of the Thames Diamond Jubilee Pageant from the Millennium Bridge in London. The poor weather forced many to adapt and even abandon their work halfway through, but here we present a selection of the pictures. 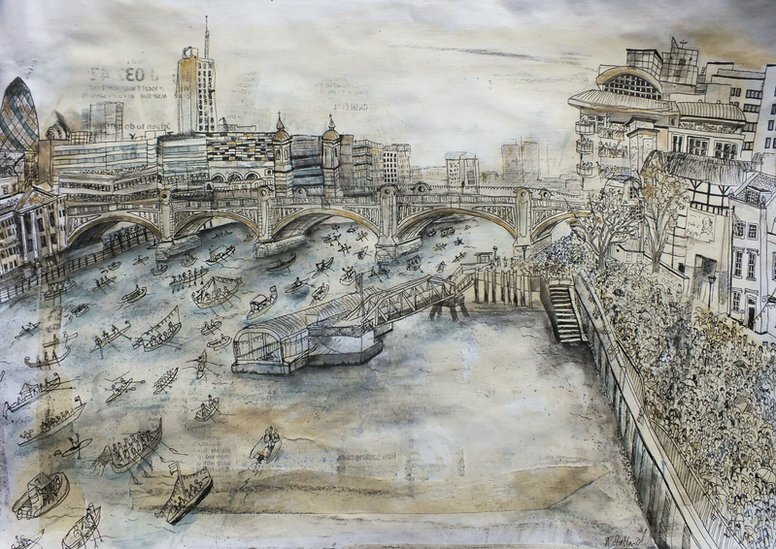 Graphic artist and supply teacher Nadine Walker, from Catford, London, was forced to abandon her pen and ink work when the rain arrived mid-afternoon on Sunday. Haidee-Jo Summers created this work in oils. 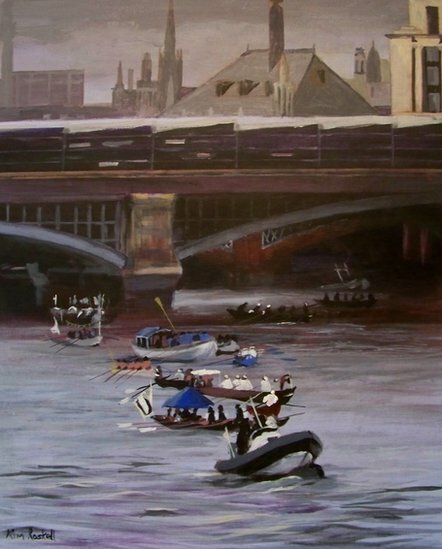 She said: "I would have added more boats and details but unfortunately my canvas became too wet and the paint wouldn't adhere." 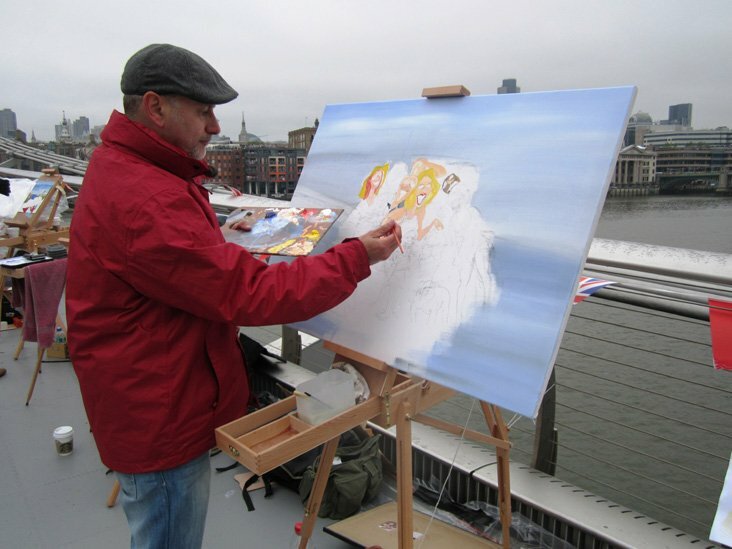 Prize Winning Artist Paul Alcock from Southend said: "It was a really fantastic experience which I thoroughly enjoyed despite being one of the most difficult, cold and uncomfortable painting experiences I've had." 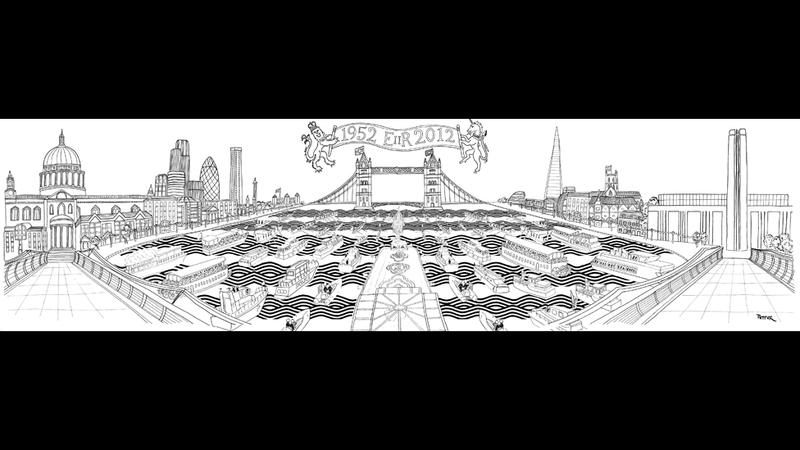 Artist Rob Pepper from Dorset drew this intricate panorama. 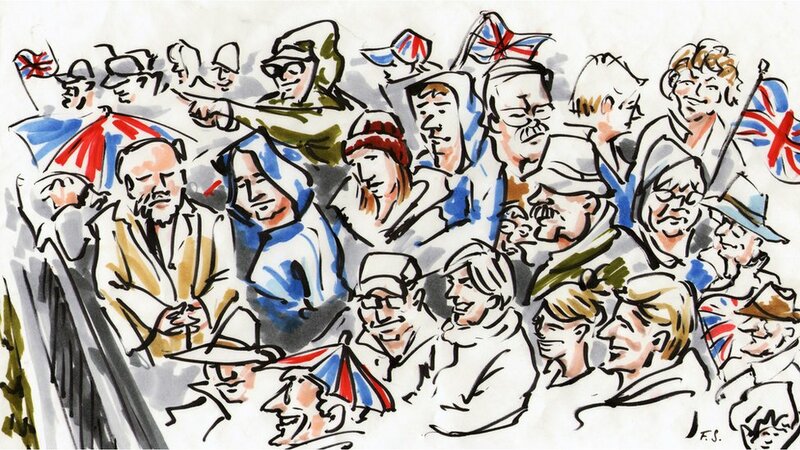 Florian Alexander Schmidt, a student at The Royal College of Art, chose to draw faces from the crowd and many of his fellow artists. Modern artist Peter Vaillant was forced to leave the drawing incomplete when rain threatened to destroy all his hard work. 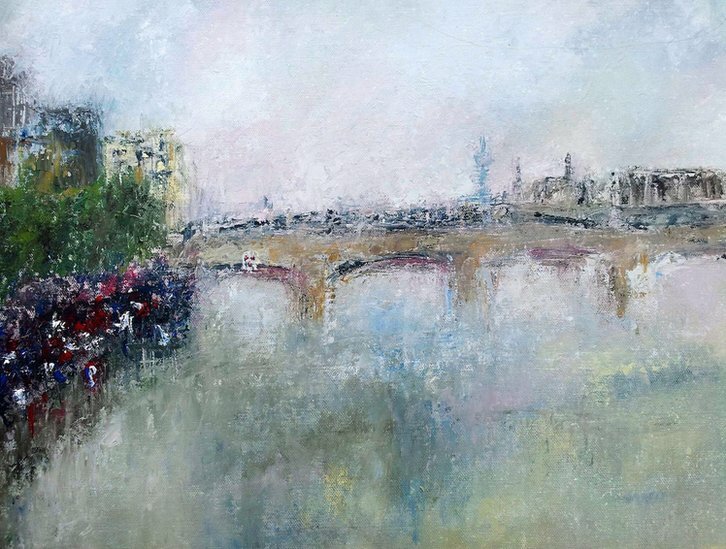 Buckinghamshire artist Ali Cockrean's study in oils was almost destroyed by the wet weather. 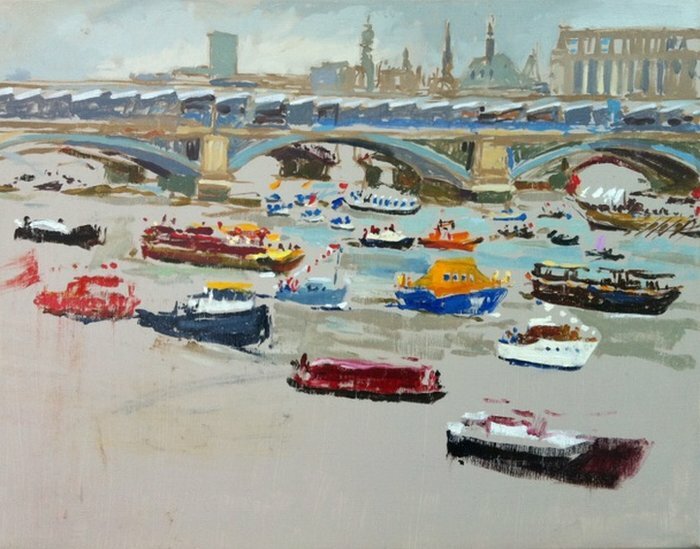 Plein-Air artist and newly invited associate member of the Royal Institute of Oil Painters David Pilgrim stayed until the very last possible moment to finish his work before being forced to abandon his position on the Millennium Bridge due to heavy rain. Environmentalist and ex-British Army soldier Adjani Okpu-Egbe believes that the Queen has been responsible for opening doors for women, such as his own mother, all over the Commonwealth. 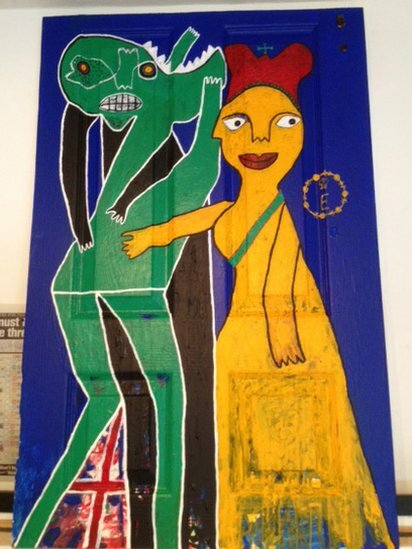 In order to portray this, he painted his interpretation on a piece of wooden door salvaged from the banks of the Thames. This picture represents the Queen's love and dedication to us all in what can sometimes be a difficult environment. 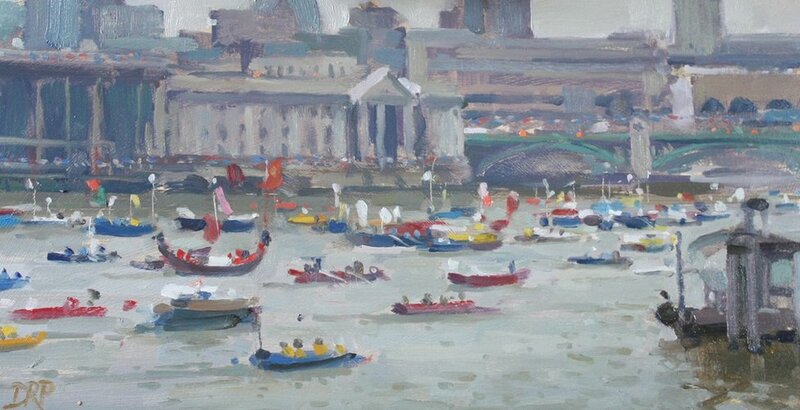 Oil painter David Porteous-Butler travelled from Suffolk to paint his interpretation of the crowds lining the Thames near Bankside Pier during the pageant. He was forced to abandon the work due to the rain; this is his uncompleted picture. 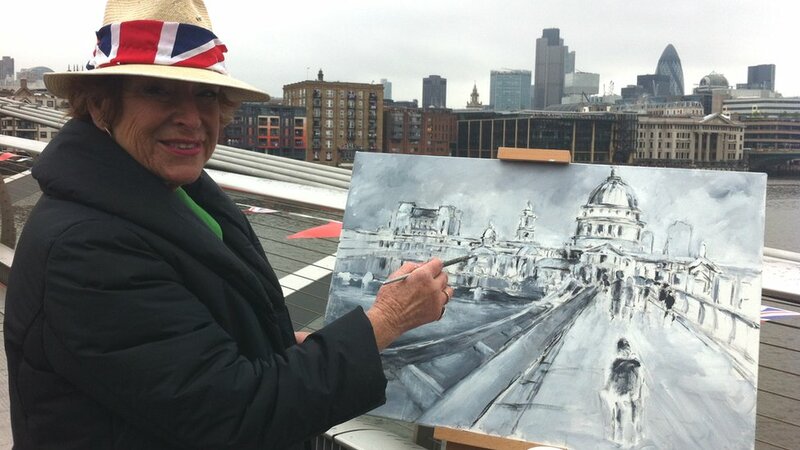 Sue Jelley, President of The Society of Women Artists, is seen here with her interpretation of the London vista. 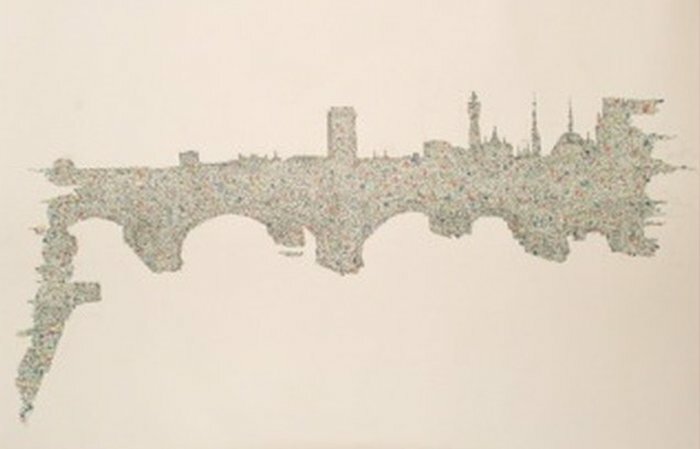 Art Student Roanna Stallard, 19, created her intricate drawing using pen, ink, acrylic and chalk on mixed media - in this instance recycled newsprint paper. 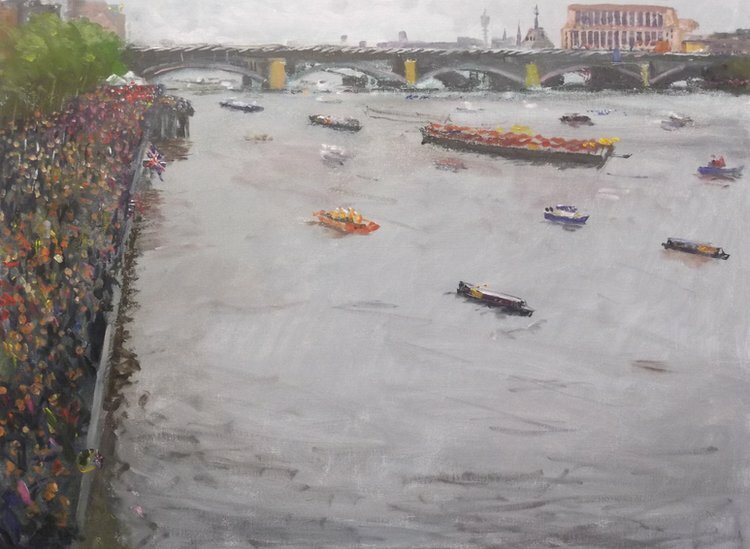 Professional Artist James Milroy made his way from Stroud to capture scenes from the Thames Diamond Jubilee from Millennium Bridge. He used permanent marker pens on Sunday but the rain proved even too much for these and he reports that he's still trying to dry the image out! 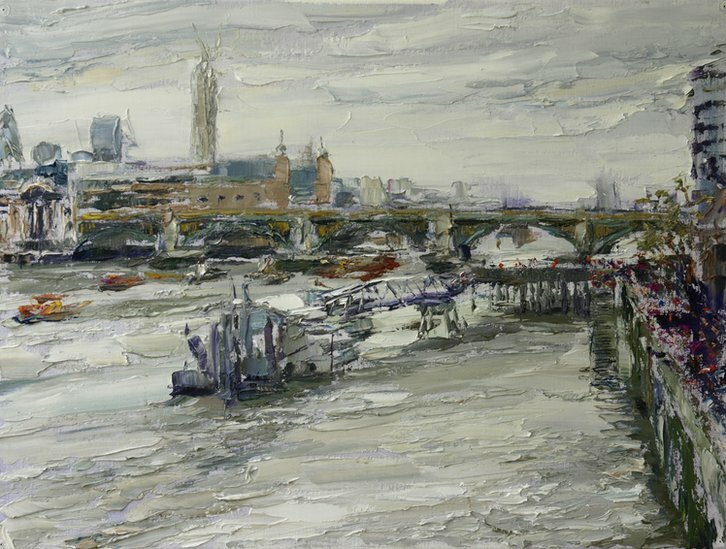 Londoner, Caroline de Peyrecave is a respected oil painter and portrait artist. 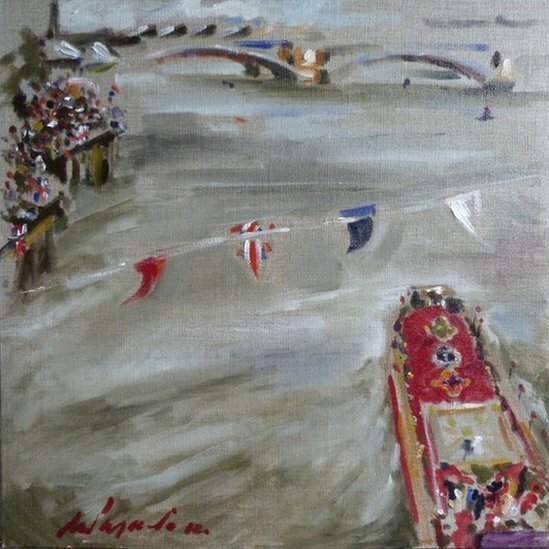 Despite the weather she soldiered on until the very end, producing a work in oils of the Royal Barge passing underneath Millennium Bridge. 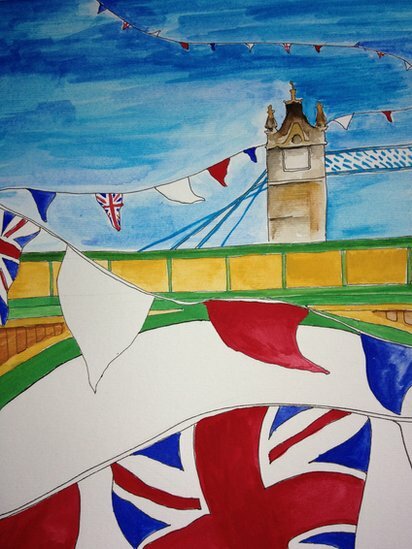 Kim Roskell created her vision in acrylics. 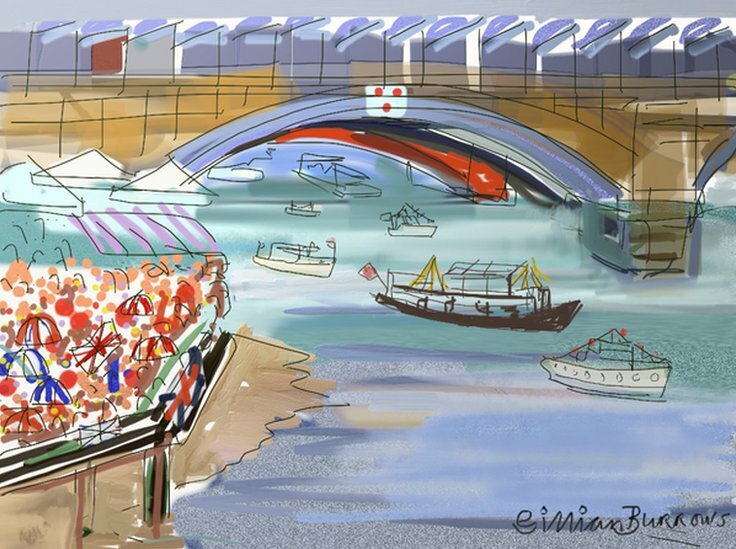 Thames Artist Gillian Burrows, 70, works with traditional mediums but has recently taken up drawing on her iPad. 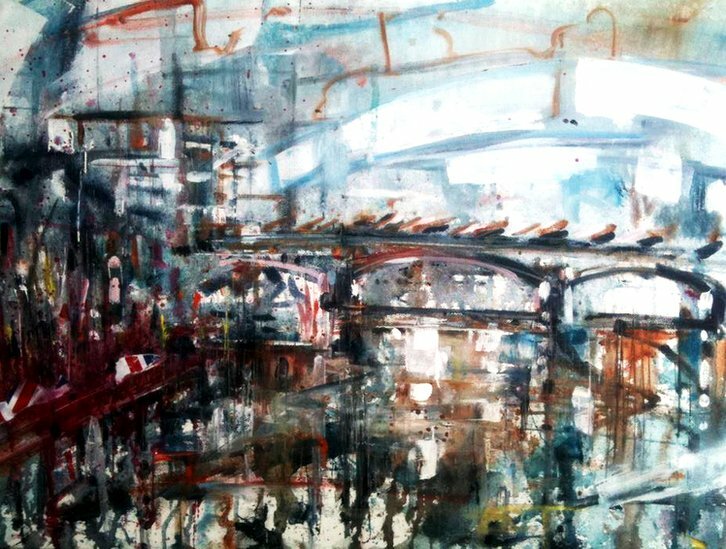 Mary Smith from Derbyshire created her painting using acrylic and watercolours. Keeping it dry was the biggest challenge of the day. Derek Baker, of Wolverhampton, has a unique style which he calls "Fun Portraiture". 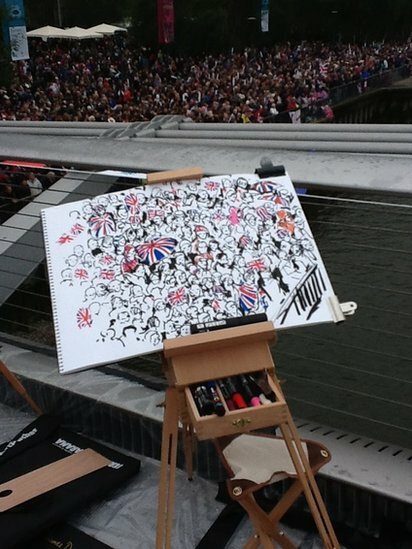 His artwork of the crowd was nearly destroyed by the rain and he intends to try to save it in his studio.